Chop Suey is one of those lodestones of American cuisine, in the sense that, like the hot dog, or hamburger, it has mysterious origins. Long considered a bastardization of “real” Chinese food, today the picture is more nuanced. First, the dish under the same or similar names exists in other places, mostly far-flung outposts of early China trade, reached by sea. Jack Kerouac wrote in On The Road, “The waves are Chinese … the earth is an Indian thing”. So you find it in east end London, in Port Darwin, in Rio de Janeiro, and in Malaya (I like the romance of the older spelling, sorry). Recent advances in food history have confirmed pretty much that it is an authentic Chinese dish, simply from a distant southern province whence many emigrants departed, hence implantation in other places. All details are in this impressive Wikipedia entry for chop suey. At least two books have been written on chop suey, both cited in the article mentioned, hunting its origins and contributing to its status as a dish with the cultural importance of pizza, the burger, the bagel. Truth to tell, chop suey has probably slipped from the cultural food pantheon. I doubt most millennials know what it is. Today, Chinese cooking is at a high pitch in North America with every conceivable regional type presented, not to mention fusion and other novel styles. Older dishes which sound half-American and evoke the small town to boot don’t appeal as much. It’s dad’s era, if not gran-dad’s. Still, you find it on menus around this burg without, I’m glad to say, ironic overtones. Not yet anyway. The example shown was spotted on a walk mid-town yesterday. Maybe now is the time to say this: I have never had chop suey. Ever. It’s not intentional, but for some reason we don’t think of ordering it when out. 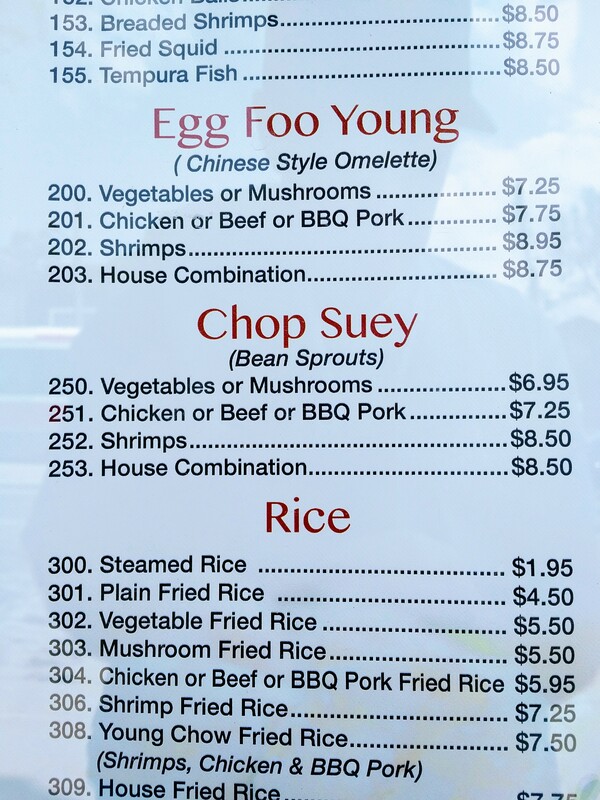 I think I had egg foo young, a dish with some parallels to chop suey, once. I plan to remedy this omission soon. 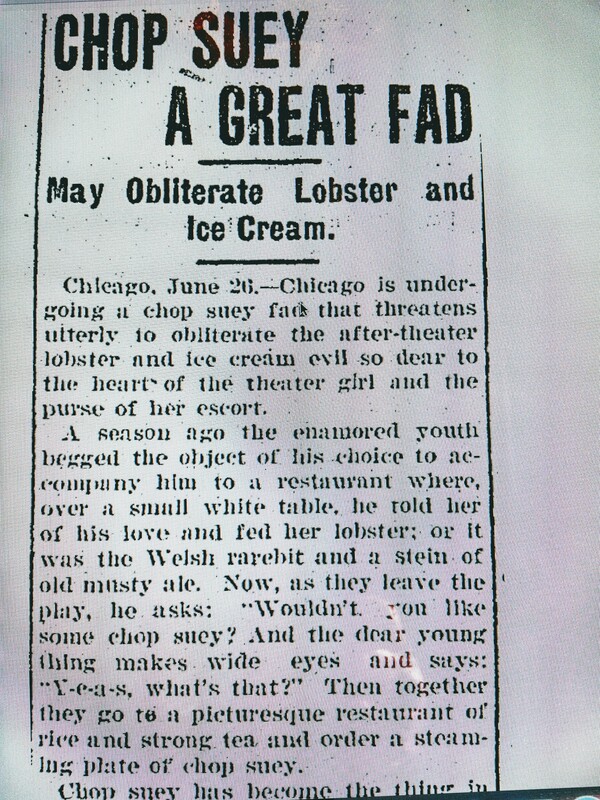 When researching the history of musty ale, I came across an early (1903) description of chop suey in a Chicago newspaper, the Quincy Daily Tribune. It is a detailed and interesting account, the dish is like “hot salad”, the journalist said. The same scribe said it was enhanced with a rich sauce unknown to its place of origin, but whether that is true is hard to say. The English food scholar Elizabeth David wrote that “the girl in West End theatre programmes”, this is early post-Second War, said “I want everything Chinese tonight”. That was the kind of atmosphere developing in our big cities 50 years earlier. Chinese food was not just a single dish but an experience, eaten with numerous brother dishes and of course the tea for which China is a byword. And the atmosphere of these restaurants added allure, as the full 1903 article makes clear. Chinese cuisine, of which chop suey was an early symbol, was jostling for attention with local foods and drinks. The Daily Herald worried there would be no more post-show tètes-à-tètes with musty ale and red lobster, it’s tea and chop suey now. Well, not really. Musty ale did disappear without (almost) a trace after Prohibition, as did its fast friend Welsh rabbit, but this hadn’t much to do with Chinese food. They had their day. As for red lobster, it’s as popular as ever. In fact Chinese restaurants do about the best work with it, it’s the ginger and garlic I think. Win-win you might say. Note re image: the first image above was extracted from the news article contained in the newspaper issue linked in the text, archived by the California digital archive service stated in the link. Image is used herein for educational and historical purposes. All intellectual property in the source belongs solely to its lawful owner, as applicable All feedback welcomed. *Note added Feb. 26, 2018. However, the consul’s apparent role in popularizing chop suey was adverted to earlier in literature, I have just learned. See this update. Yes thanks and there are numerous citations in the late 1800s, in New York in particular where the dish was well-established by 1900 in Chinatown. The Chicago one I mentioned shows the dish was relatively new there and exhibits a typical American reaction, i.e., by those who hadn’t yet encountered it which was still the great bulk of people. By the 1920s, it was being canned in Chicago along with its old rival, Welsh rabbit, spaghetti and many soups still familiar. It had arrived. The Wikipedia article’s earliest cite is an article by the Chinese American writer Wong Chin Foo in 1884. By 1885 another article by him appeared in The Chicago News, and the Wichita Daily Eagle reprinted it on July 24, 1885. His article describes a Chinese restaurant serving “chow chop sue (a ragout of chicken liver, lean pork, bamboo tip, celery, bean shoots and onions)” and it appears to have been reprinted far afield — the August 31, 1887 Riverina Recorder in New South Wales carried a version (without giving credit to Wong Chin Foo) and it appears in other Australian newspapers soon after, such as the Kapunda Herald and The Western Champion.